Spend an enchanted evening at the historic 1832 Jacob Blauvelt farmhouse. The evening is magical as the historic house is illuminated with candlelight and lanterns, fragrant with traditional sweets and decorated with festive greenery. Experience Dutch-American holiday traditions of the 1830s with 19th century music and song, docents in period costumes and seasonal refreshments. TIcket price includes admission to the 37th Annual Miniature, Dollhouse & Art Exhibition: Memories. Visit the Historical Society of Rockland County on the first two weekends in December for an unforgettable program of magic and fun! We’re opening the doors to our 1832 Jacob Blauvelt House to welcome children of all ages to celebrate St. Nicholas Day, as we have done since 1961. This event is a highlight of the holiday season and a Rockland County tradition. Adults who visited with St. Nicholas in the past as children now bring their own families. Each child receives a special treat in his or her shoe from St. Nicholas, and everyone can visit with St. Nicholas and his horse, enjoy refreshments, and visit our 37th Annual Miniature, Dollhouse and Art Exhibition. In this illustrated talk, George Potanovic Jr., author and designer of Honoring Our Heritage: Celebrating the People, Science and Innovation at Pearl River, traces the 105-year history of Lederle Laboratories of Pearl River, NY. Lederle Laboratories was founded by Dr. Ernst Lederle, who was born on Staten Island, NY in 1865 and went on to become chief chemist of the New York City Department of Health and twice New York City Health Commissioner at the turn of the century. Potanovic will speak about how the book captures the amazing history of Lederle Laboratories in Pearl River, NY, which is a very important part of Rockland County's history and pays tribute to the proud and dedicated people who served, as Dr. Lederle had envisioned it, the greater public good. As a courtesy to the speaker, please arrive early to avoid interruptions. Lecture will begin promptly at 7:15, latecomers with reservations may forfeit their seat. Walk-ins will only be admitted if space permits. A limited number of copies of Honoring Our Heritage are available for sale at the HSRC. A walking tour guided by Dr. Travis Jackson, who will speak about the history of Hillburn and the village’s important role in the Civil Rights Movement. In collaboration with The Historic Society of Rockland County, please join special guest Dr. Travis Jackson on Sunday, October 28th from 1:00 pm - 3:00 PM for an easy (1 sneaker) 2-mile walk through the historic Village of Hillburn. This "walk and talk" features the history of Hillburn in addition to the personal comments of Dr. Travis Jackson, a long time Hillburn resident and student of the Brook School, who went on to become Suffern High School Class President and Teacher in the Ramapo Central School District, among several other distinctions. The Historical Society of Rockland County Invites You to Join Us on a Daytrip to Visit Ramapo with County and Ramapo Town Historian Craig Long. This is the fifth and final Historic Rockland Daytrip for 2012: From mansions to mountains, from the Sloat House to the Ramapo Salt Box House, come join us! Highlights will include the American Revolutionary War Entrenchments, Spook Rock, Indian Rock, the Ryan and Pierson mansions and more! Price: $59/person ($54/person for HSRC members). Includes bus transportation, historian guided tour and a scrumptious lunch at Waterwheel Restaurant (all tips included). This trip will depart from Ramapo Town Hall, 237 Rt. 59, in Airmont (just a west and diagonally across the road from Walmart at 250 Rt. 59). When entering Ramapo Town Hall parking lot, proceed straight to the back of the lot. The bus will be waiting in the right corner. At the conclusion of the guided tour, guests will be disembark at the same location. Guests should proceed to the Waterwheel Restaurant in his/her own vehicle. Turn right out of the parking lot, proceed East toward Nyack. Waterwheel is located at 272 Rt. 59, Airmont, NY 10901 (same side of the road as Walmart). Where: Tickets available for purchase on the day of the House Tour at the Haverstraw Village Hall, 40 New Main Street, Haverstraw. Join us for a special Gallery Talk with Kerwin McCarthy, guest curator of our current exhibition "Letchworth Village: The Village Years." Letchworth Village, was a residential institution located in Thiells, New York, built for the developmentally disabled of all ages from the newborn to the elderly. Opened in 1911, Letchworth Village at its peak consisted of over 130 buildings spread out over 2,000 acres of land.The exhibition commemorates the centennial of Letchworth Village and illustrates how Letchworth began, how it grew and thrived and then how and why it declined and finally closed at the end of the 20th century. The exhibition uses many photographic images, including those of Margaret Bourke-White, who visited Letchworth in 1932, and of Arnold Genthe, who visited in 1941. This will be the only opportunity to hear Kerwin McCarthy discuss this informative and educational exhibition. In addition to curating this exhibition, Mr. McCarthy is a public affairs official for the Hudson Valley Office of the Developmentally Disabled, Region 4. He has been working for this office for the past 31 years. Among items for sale will be folk-life toys, publications relating to life in Rockland County and historical maps -- all great gift ideas! We welcome back Peter Artin who will demonstrate the art of blacksmithing and The Ramapo Fault Band will play their wonderful music again this year and entertainer Dikki Ellis will be back with fun for the whole family! Nickel-o Farms will bring a pony for children to ride between 11am – 1pm. The History Center's Museum Galleries will also be open for our guests to enjoy our current interesting exhibitions: Letchworth Village: The Village Years and Rockland Voices. Price: Admission is $FREE, but reservations are required! In this illustrated lecture, “The Unknown Palisades,” Eric Nelsen of the Palisades Interstate Park System brings the story of the Palisades to life. Among the topics covered are the villages that once dotted the shores; the palatial estates that rose on the summit; the epic struggle of the New Jersey Women’s Clubs and others to preserve the cliffs from defacement by massive stone quarries; the bathing beaches and other facilities that ran at full-tilt during the early decades of the twentieth century; the work of the New Deal agencies in the park during the Great Depression; and the oasis that the park has become in today’s busy world. Come tour with us and find out about the really historic Stony Point...it’s not just a Battlefield! Relax on a comfortable bus, microphone equipped, while we tour the town, see the sites and step off to explore a few locations more closely. We will meet and board the bus at Fireside Restaurant on Rt. 9W in Stony Point. We’ll step back in time and hear of Mad Anthony Wayne, see the churches of today and yesterday and visit the Gilmore Sloane House. Highlights will include the Pyngyp School, lime kiln, the Ice House ruins, the oldest houses, the Mitch Miller House, “Teachers Rest,” the former Lovett plant, the onetime amusement park turned arsenal…and MORE! Please join us to see, right in our own backyard, the locations of significant happenings in our nation’s earlier days. Price: $59/person ($54/person for HSRC members). Includes bus transportation, historian guided tour and lunch at La Terrazza. Our Historic Rockland Day Trip Series Continues . . .
Come along on a tour to explore the rich history of Clarkstown, NY with Town Historian Bob Knight. Guests will learn about the town's old farms and its role in moviemaking history. We will view landmarks in several hamlets. Guests will see endangered structures and preserved properties, as well as the oldest house in Clarkstown. The trip will include a visit to the Congers Railroad Station Museum with a brief guided tour, and a glimpse of the site of New York's last witch trial. The bus will also travel into Tilcon quarry with a guide. Other highlights include learning more about the town's former airports, racetracks and celebrity residents. We will visit the beauty and culture of Tolstoy, the Ellis Island of Rockland. Following this informative tour, guests will enjoy a three-course lunch at La Terrazza Restaurant. Bus departs from and returns to La Terrazza Restaurant. Be ready to board the bus at 8:45 am for this full morning tour! The Trip and Lunch will conclude approximately 1:30 pm or with the end of lunch. To learn more about La Terrazza restaurant, visit http://www.laterrazza.com. Price: $59/person ($54/person for HSRC members). Includes bus transportation, historian guided tour and a lunch. Learn about the brick industry and the fortunes made (Haverstraw was known as Bricktown) - many of the beautiful town houses in NYC were built with Haverstraw brick. See Tiffany windows, the site of Benedict Arnold's Treason House, learn of Babe Ruth's time here, see the house made famous by Edward Hopper, and the home that the "Bates Motel" from the movie "Psycho" was modeled after, and much more. We will get off the bus at a few locations. This will be a fabulous opportunity to learn about little known Rockland history. The tour will end at Union Restaurant, where we will have a delightful 3 course lunch: appetizer, choice of entre (fish, chicken or pasta), dessert, coffee and conversation! Our first stop is the Hill-Hold and Brick House Museums built in the 1760s. These museums reflect the lives of two family homesteads of the Hudson Valley. At Hill-Hold we’ll visit the one-room school house, a historic barn, and farm animal exhibits. Then it’s on to Brick House where we will stroll across tree-shaded lawns and tour the country mansion that was home to seven generations of the Hill family. Aferward we’ll dine at The River Grill nestled on Newburgh’s historic waterfront with picturesque views of the Hudson River. Our final adventure will be to board the River Rose Paddlewheeler for an afternoon excursion on the Hudson. This authentic “stern drive Paddlewheeler” is a classic and reminiscent of Mark Twain’s Mississippi River days! Don’t miss this fun-filled summer outing! Price: $59/person ($54/person for HSRC members). Includes bus transportation, guided tour and a lunch at Union Restaurant (appetizer, choice of entree, dessert, coffee and conversation! For more information on Union Restaurant visit http://unionrestaurant.net. The Living Landmark award honors an individual who has demonstrated commitment and service and who has made a difference here in Rockland and beyond. In doing so, this individual represents the County of Rockland’s spirit and history. Tess McCormack-Raso is a native of Rockland County. She has spent most of her life in the area. A veteran of the US Air Force, she was a communications specialist at the Pentagon Building, Washington, DC. She then returned to Rockland County to live and participate actively in the community. While engaged in community service, Tess was employed for 25 years as Law Office Administrator for the firm McCormack, Damiani, Lowe & Mellion, Esqs. She was the wife of Gilbert R. McCormack, Esq; the mother of three children--Richard, Ronald andTeri; grandmother of six--Kelly, Jesse, Michael, Megan, Danielle and Zachary. In September 2000 she married Joseph F. Raso. Tess McCormack-Raso remains a source of positive energy, support and development for the community of Rockland County. She has received numerous awards and citations throughout her lifetime of service. Gardner Watts has enriched the lives of hundreds of people by sharing his love of history, hiking and out of doors. In 1956 he established the Suffern Historical Hikers and led hides, along with his wife, Josephine, into the Ramapo Mountains. His hikes introduced new and old residents to Rockland’s extensive state park system and its many historic sites. Teaching history in a positive, affirming and interesting way, Gardner had amost 200 people join him for the weekly Historical Hikes in spring and fall. He wrote hiking pamphlets for Cooperative Extension in the 1970s and was a contributor to the Trailside Museums & Zoo Historical Papers. In 2010 his Historical Paper on Boy Scout founder Daniel Carter Beard was reprinted in South of the Mountains. Gardner Watts has served and lived in the Suffern community for most of his life. For over 30 years Gardner taught history at Suffern High School. From 1958 – 2007, he served as the appointed historian for the Village of Suffern and was instrumental in establishing the Suffern Village Museum. An avid tennis player, Gardner was the high school tennis coach for 25 years, was Rockland County tennis champion four times, and continued to play a vigorous game into his nineties. Devoted parents, he and Josephine (who died in 2006) raised five children. Price: $89/person ($79/person for HSRC members). Includes luxury bus transportation, site admissions, tours (where applicable) and lunch at Harvest's Tabor Road Tavern. Our first stop will be the Presby Memorial Iris Gardens for a self guided tour of this blooming extravaganza! The Essex County Presby Memorial Iris Gardens was established in 1927 to honor Frank H. Presby of Montclair, a leading horticulturalist and a founder of The American Iris Society. This living museum, listed on the State and National Registers of Historic Sites, offers a spectacular display of thousands of iris varieties to visitors from all over the world. The Gardens are in bloom from May 14 – June 6. Then it’s on to lunch at the Tabor Road Tavern, followed by an afternoon at The Stickley Museum: a 30-acre National Historic Landmark and the centerpiece of Gustav Stickley’s early 20th century country estate, known as Craftsman Farms. The estate includes a restored log house, which is now operated as a historic house museum. We will step into this unique historic world, learn about the Arts and Crafts Movement, and Stickley’s utopian vision and experience first-hand, all that The Stickley Museum at Craftsman Farms has to offer. It is a place like no other. Did you know there are over 25 National Register locations in Orangetown and over 35 historic markers? From the story of Andre and Arnold, to the early recording studio of Bruce Springsteen, there is something for everyone on this trip. Our guide will be Town Historian Mary Cardenas and we will see famous houses, churches and points of interest. Our trip includes a stop midday for a gourmet lunch at The '76 House in Tappan. Lunch will include a salad, choice of entree and dessert. Watch for future historical tours of Rockland in this series in the coming months. Last year's event was such a great day that we're looking forward to doing it again this year! Join Rockland's talented authors and illustrators at the 2nd Annual Authors & Illustrators Book Fair! We are very pleased to be honoring the memory of Thomas F.X. Casey by having the artist/creator Timothy J. Englert install a Knickerbocker Bench at the Historical Society of Rockland County. President of The Historical Society of Rockland County: 1988 - 1994; 2005 - 2009. Senior Historian, The Historical Society of Rockland County: 1992 - 2009. Historian, County of Rockland - 1977 - 2009. Historian, Town of Haverstraw - 1973 - 2009. Chairperson, Rockland County Historic Preservation Board. President of The Kings Daughter's Public Library, Haverstraw. Advisory Committee member for the PBS production 'The Adams Chronicles". Tom was also the author of a history of Haverstraw; co-author of a history of St. Gregory Barbarigo Church of Garnerville, of which he was a devout member; and author of various articles for the HSRC's quarterly journal, South of the Mountains. Tom was employed by the North Rockland Central School District for forty years, first as a teacher, then as a coordinator. He retired in 2001, at which time he was serving as Director of Secondary Education. Always a friend of the Historical Society of Rockland County, Tom was honored by the HSRC with the a Lifetime Service Award in 2006 and by the Rockland County Executive's Historic Preservation Merit Awards Committee with the Margaret B. and John R. Zehner Award for Historic Contribution in 2008. Based on Marianne B. Leese, '"Remembering Thomas F.X. Casey," South of the Mountains 54, no.1 (January-March 2010). 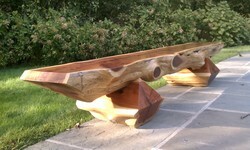 The Knickerbocker Bench was created by Timothy Englert in 2007 as a gift to Rockland Lake State Park. It is named for the historic ice houses that lined the lake, and a forgotten industry that was once one of the nation's most vital. The first benches were made with rot resistant locust logs found within the ruins of ice house #3, and coincided with the first Knickerbocker Ice Festival, which Tim co-founded. They have been made from a variety of woods suitable for interior and exterior use. The design is intended to evoke the rustic tradition within a modern contect, and took inspiration from the rustic architecture found within the Palisades region of the New York State Parks. Tim's most recent benches were featured in the exhibit Hudson valley Artists 2011: Exercises in Unnecessary Beauty at the Samuel Dorsky Museum of Art in New Paltz. The Annual Meeting of the Historical Society of Rockland County will be held on Monday, April 9, 2012 at the Museum, 20 Zukor Road, New City, New York at 7:00 pm in the Community Room. The order of business will include reports of the committees. Rarely seen objects from the Society's Collections will be on display. All members of the public are invited. The Historical Society of Rockland County invites you to join us on a daytrip to visit the American Museum of Natural History in New York City. Price: $50/person ($45/person for HSRC Members). Price includes luxury bus transportation, docent guided tour and a museum pass to view 45 exhibitions. Bring or buy your own lunch. Join us as we visit the American Museum of Natural History. We will begin with a guided "highlights" tour of the Gems and Minerals exhibition space where we will learn more about the Pearls of Pearl River. Then we will visit The Butterfly Conservatory before breaking for lunch. Lunch is on your own -- we will suggest three (3) lunch spots inside and just outside the museum after your registration. Our time to see the new Bioluminescense exhibit is 2:15 pm. Guests will have time to visit other permanent exhibitions in the museum such as The Rose Center, Eastern Woodland Indians, Biodiversity, Ocean Life, African Mammals, Dinosaurs, Human Origins and to shop in the Museum Store! Celebrate the region's best folk traditions at the Spring Family Day on the grounds of the Historical Society of Rockland County! Get to know cultural groups through an educational presentation "The Moveable Feasts" which will feature the food and cultural items of three spring festivals celebrated by the Jewish (Passover), Indian (Holi) and Ukranian (Easter) communitites. Folk dances will be performed, and children will hear stories behind how these festivals originated and why they continue to be celebrated. Food samples and crafts will be part of this unique family experience. This program will be hosted by Folklorist Puja Sahney and will include local contributions from The India Cultural Society of Rockland, The Jewish Federation of Rockland and others. This program has been made possible in part by public funds from the Folk Arts Program of the New York State Council on the Arts, a New York State agency. Following the "Moveable Feasts" presentation, children will enjoy (weather permitting) an egg hunt on the grounds of the historic Jacob Blauvelt House. Afterward, all will enjoy a fun-filled concert by Rockland's own Jeffrey Friedberg and his Bossy Frog Band. Mr. Eugene Erickson & Mrs. Martha Erickson and The Rockland County Chapters of the Sons and Daughters of the American Revolution. This annual event was held at The View on-the-Hudson in Piermont. Leave the driving (and parking) to us! Join us as we visit the newly restored New York Historical Society. We begin with a guided “highlights” tour of the museum, followed by a viewing of the theatrical media film experience New York Story. Next, we dine at Caffè Storico (Italian for “historic”) the newest restaurant from the acclaimed restaurateur Stephen Starr, (of Buddakan and Morimoto) which delights with casual elegance and features dishes inspired by classic Italian cicchetti, or small plates, as well as handmade artisanal pastas. After lunch, we will be introduced to Revolution! The Atlantic World Reborn. The first exhibition to relate the American, French and Haitian revolutions as a single, global narrative. Spanning decades of enormous political and cultural changes, from the triumph of British imperial power in 1763 to the end of the Napoleonic wars in 1815, Revolution! traces how an ideal of popular sovereignty, introduced through the American fight for independence, soon sparked more radical calls for a recognition of universal human rights, and set off attacks on both sides of the Atlantic against hereditary privilege and slavery. It also recounts the famed careers of such revolutionaries as Thomas Paine, Jean-Baptiste Belley and Dominique Toussaint L’Overture. Finally, guests will have time to visit other exhibitions in the museum such as Beauties of the Gilded Age: Peter Marié's Miniatures of Society Women and Making American Taste: Narrative Art for a New Democracy.